As small businesses grow they eventually reach a point at which the demands of the business require specific IT server applications such as an email server. Microsoft makes the transition easier by providing preconfigured, cost-effective versions of their server OS for small business, which allows SMBs to move to server-hosted applications more quickly and easily than in the past. Setup of these applications is wizard driven and can be deployed without a great deal of expertise. Drobo provides superior data protection with BeyondRAID™ technology, in a package designed for SMBs to be easy to use. Expanding storage is affordable with the ability to add any drive, and replacing a drive in the event of a failure is as easy as following red/yellow/green traffic signals. Drastically simpler than using internal RAID, thin provisioning is built in, as is the option of dual-drive redundancy for additional protection. 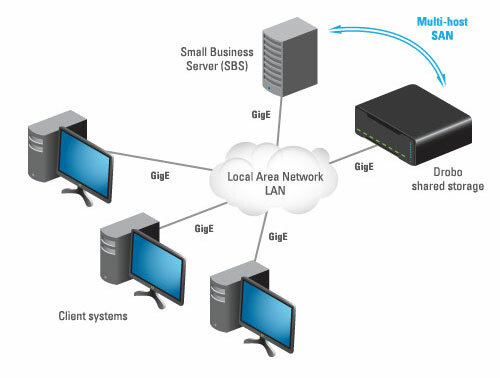 As small businesses grow they eventually reach a point where the demands of the business require a specific IT server application such as an email server, file server, database server, or web server. Operating system (OS) vendors like Microsoft have made this transition easier by providing preconfigured, cost effective versions of their server OS for small business, which enables SMBs to move to server-hosted applications faster than in the past. As a result they are more likely to need a storage device that can be shared among several servers at the same time. But even with single servers, reliable and expandable storage is a requirement. SBS systems are almost always physically small in size, with a small number of drive bays for storage. They usually have the option for internal RAID storage for reliability, but they offer limited expandability and can be challenging to manage in response to a disk failure or for growth. Small business implies easy implementation, with many of the more complicated networking settings preconfigured and step-by-step wizards to complete the installation. As stated above, they include the common core applications needed by small businesses moving to a server-hosted environment. Setup of these applications is also wizard driven allowing the SMB to bring applications online without needing a great deal of expertise. Unlike laptop or desktop environments, multiple users count on their server to be up and running all the time. So the storage device needs to be up to the task. One of the most likely components to fail in a server is a hard drive, and internal storage systems can only do so much to provide protection. External storage better meets the requirements of a Small Business Server by offering more robust protection and expandability while also being easier to manage. Install Drobo Dashboard on management server or any laptop or PC. Deploy iSCSI SAN storage, easy one-click setup with Drobo. Configure SmartVolumes, can be a one-time step with thin provisioning built-in. Rescan to recognise storage, though new storage pops up automatically in most cases! As you fill up storage, simply insert SATA drives (including 3 TB and larger drives) into available slots, or replace a smaller drive with a larger one. With internal RAID, expanding with additional drives is complex, and drive slots in SBS systems are limited. Replacing a smaller drive with a larger one is not possible or requires all drives. The ease of connecting Drobo in an SBS environment. SAN storage is a must if you want to build a server environment that supports today's workloads and be ready for the next server or the addition of server virtualisation. Drobo provides superior data protection with BeyondRAID technology, in a package designed for SMBs to be easy to use. Expanding storage is affordable with the ability to add any drive, and replacing a drive in the event of a failure is as easy as following red/yellow/green traffic signals. Drastically simpler than using internal RAID, thin provisioning is built in, as is the option of dual-drive redundancy for additional protection. If the environment is not ready for SAN with Drobo model B800i, DroboPro provides the same benefits of BeyondRAID, just for a single server supporting smaller environments. Despite limited budget, the SBS storage solution can start with a DroboPro, and when scaling out servers and going to an iSCSI SAN with Drobo SAN for Business in the future, DroboPro can move to Tier 2 as backup storage. With Drobo you always have the best storage experience eve!